According to Reggie, the Master Sword will also remain at Nintendo of America's headquarters to help the next hero fight for wisdom, courage and power - we're guessing the next person to inherit the sword will be Doug Bowser. Speaking of which, @thetruebowser took to Twitter himself to thank Reggie for everything over the years. At the time of writing, Bowser's Twitter profile hasn't been updated yet to reflect his new role at Nintendo of America. We'll be sure to let you know if Reggie posts anything else relevant to Nintendo in the future. Sad that he didn’t present a last direct. I know some people think he is just a pr tool. But I guess there will be a lot more people, like me, that will miss him. Best to you Reggie. The new guy being named Bowser is like how local weathermen are name "Storm" or "Rain" or whatever. Rumor has it he isn't really retired and he plans to join Bandai and spearhead the launch of their new WonderSwitch Color handheld. Btw, so Doug Bowser will take over Reggie's office ? Was never a big Reggie fan but i suppose congrats is in order- I hope he enjoys his millions! 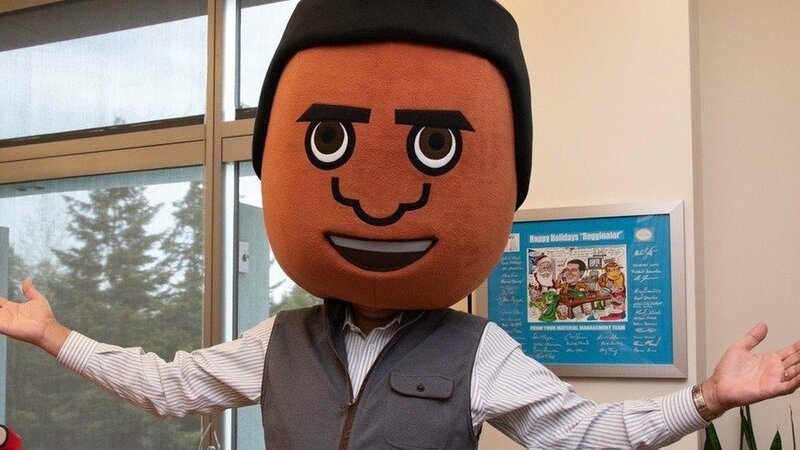 He doesn't get to keep the Mii-head? What about Muppet Reggie? I’m pretty sure that the “Happy Holidays” picture behind Reggie in the first photo is cursed. Or has Dorian Grey like powers, which is why Reggie looks like he hasn’t aged at all since 2004. But seriously I hope Reggie is successful at whatever he does next. Wishing you well Reggie. But NL, please don’t publish his future tweets as newsworthy - those that want to know what’s happening in the social-media-world can follow him on Twitter. No Farewell Direct though. Perhaps they’ll do one to welcome Bowser soon instead? As others have sad, I am disappointed he did not appear in a "final" direct. That being said, I'm very happy to reflect on the Reggie's history and I'm glad he is able to retire happily with his family at a relativity early age. That's a life goal of mine so I'm very happy for him! At the very least, we can let the memes live on with Doug Bowser and Reggie's Twitter account! @gaga64 Yeah, that was a little disappointing to me but Reggie did introduce some amazing consoles and games from the start too though. Jeez, Reggie’s hand could crush my head! Calling now that a farewell ceremony will see the light of day around the time of E3. As long as Nintendo-related tweet, it's fine. I will be more than happy to hear more about the escapades of the Regginator! Please keep me posted! "President at Nintendo of America. Original Donkey Kong Arcade Master. Views are mine (as are the Goombas, Koopa Troopa...)." Btw, i'm sure we will get a greeting video from Doug Bowser for his first time as Nintendo CEO. See ya later, Mr. Reggie! It's been awesome. I thought Reggie did a great job. In my opinion, he advanced the brand in NA and at the same time was entertaining. Bye, Reggie, and thanks for all the memories. Before I truly knew who you were, FILS-A-MECH was an amazing Mii in Tomodachi Life (he married Rosalina, if I remember correctly 😂). Please keep that same wonderful charisma and energy and channel it into whatever you do next. I hope you and your family are very happy in the future. God bless y’all, and I’m wishing you well the best! Some seem to forget that most Nintendo Directs are pre-recorded. It's still possible at this point in time for Reggie to appear in one. I definitely foresee a Bowser introduction. I wish you the best, Reggie! We'll miss you Reggie! I hope he still attends Nintendo events from time to time! I'm gonna miss the guy. He's always been the face of the company for me, and he always make me laugh. Best of luck for his retirement! @HarryHyruleHero Could be. However I am expecting a super mario maker 2 direct in april/may and then a great e3 direct, with finally more info on all the other games.